Industry analyst Strategy Analytics confirmed that Ricoh has the highest sales in the 360 camera industry, followed by Samsung and LG. This is consistent with what I found previously for sales ranking (except that Samsung is doing much better than in the results I found). Strategy Analytics also forecast that sales for 360 cameras will grow 350% over the next two years. This is pretty impressive, considering that the market for point-and-shoot cameras has all but disappeared, and even interchangeable lens camera sales are declining (with the exception of Sony mirrorless cameras). 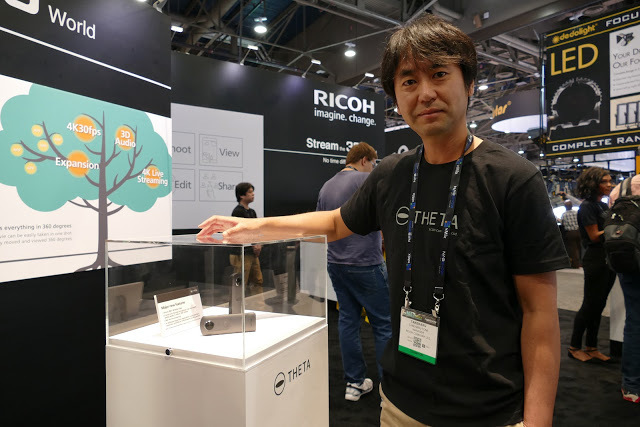 At NAB Show, Ricoh showed the highly anticipated new 4K Theta, which features 4K video @ 30fps, live streaming at 4K 30 fps, 4-channel microphone for spatial audio, and an Android operating system that will allow anyone to make apps for it more easily. I did not get a hands-on with the Theta 4K 🙁 but they did show a sample 360 video from the Theta 4K on a screen. The sample did not have 30fps yet, but it did show very good detail, and there was no question it really was 4K. And from what I could see, it seems to have less chromatic aberration, although I could be wrong about that. As for specifications, I could not get anything out of Ricoh’s representatives. Nothing about photo resolution, whether it will have a removable storage, or removable battery, or the price, is the streaming wired or wireless, or any other info. Maybe I should have had drinks with them first! The only thing is that they reiterated that it will definitely be available in 2017. Ricoh also showed the Ricoh R, their live streaming camera. You can see samples from it here. If NAB is still on by the time you read this, you can also see a live stream from NAB on the Ricoh R YouTube channel here. Theta 4K: just a prototype (probably not working?) just to say “we are working on it”… Ricoh on late while many competitors already sells 4k and more cameras. But Ricoh has great reputation with ThetaS and the power to regain the leadership. Thanks Michael, do you think the photo resolution will improve from the Theta S? Ideally 8k! I don’t know but I think they are busy enough as it is, just trying to make the 4K video and 4k livestreaming work. So I am guessing that the chance of increasing the photo resolution is not high. Where is the GR III? Didn’t notice it at Ricoh’s booth, which seemed to be all about the Theta. Maybe I missed it?